If you were involved in a car accident in the Pinecrest community of Miami-Dade County, then you will likely need the services and advice of a Miami Car accident lawyer to protect your rights and answer your questions. At the Wolfson Law Firm, our car accident lawyers in Miami know how to help you just like all the clients we have represented since 1963. Call us today at (305) 285-1115 for your no obligation and free consultation. Allow us the opportunity to answer your questions and provide you with the options that might be available under the facts of your case. This beautiful area, close to the south side of downtown Miami encase on of the highest standards in quality of life, preservation and a well-run government board making it one of the most attractive areas to live in Miami. Pinecrest is not known as a city, but as a Village. 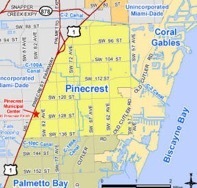 The Village of Pinecrest offers an attractive variety of the live, work and play experience in only eight square miles of land. As a municipality of Miami-Dade County, it was recognized as such in 1996. The area is known by its neatly maintained landscape, its beautiful homes and its excellent schools, such as the Belen Jesuit Preparatory School. After your Pinecrest car accident you will no doubt want to find the best Miami car accident lawyer you can find. Even though you may be injured after a car crash, you are also a consumer. It is your decision to choose the top car accident attorney in Miami who will help you. As with any decision in life, we all agree that making an informed decision after careful analysis is the best way to go. That is why at our Miami personal injury law firm, we encourage you to review our results, our qualifications and our reviews to assist you in your decision of whether the Wolfson Law Firm is the best car accident law firm for your case. Let’s face it – once you are injured in any kind of accident your life has changed – and not for the better. You will have to deal with medical treatment, medical expenses, lost wages and your own pain and suffering. These loses may not end once your case is resolved or settled. You may have future loss of earning capacity and ongoing medical expenses as well. All of these losses are difficult and can seem impossible to face alone. But you don’t need to face these issues and problems by yourself. At no cost, you can call the Miami accident and injury attorneys at the Wolfson Law Firm. We represent injury victims on a contingency fee basis which means that you will not owe any fees unless we make a recovery for you. In addition, we will advance all the costs necessary. These costs can include investigation, personal injury experts in Miami, and court costs. At the conclusion of your case, we will obtain reimbursement of the costs from the settlement or verdict. Our Miami injury lawyers have proudly and humbly served the good people of South Florida since 1963 and those neighborhoods, towns and communities include Homestead, Hialeah, South Miami, Palmetto Bay, Cutler Ridge, Kendall, Downtown Miami, Coconut Grove, Coral Gables, Princeton, Florida City and Miami Beach.